Q: What are Building Blocks Vitamins? A: Building Blocks Vitamins are essential bariatric supplements for those who have undergone any form of bariatric surgery, including gastric bypass, sleeve gastrectomy, duodenal switch, and gastric band (Lap-Band). Q: As someone who has undergone a bariatric procedure, why is it important for me to be taking bariatric specific supplements such as Building Blocks Vitamins? A: After bariatric surgery, your body will require greater amounts of supplements that contain forms which are of a higher efficacy than most standard vitamin supplements. This need is due to the malabsorptive aspects of the surgery, as well as new diet and lifestyle changes post-surgery. 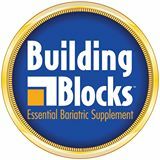 Building Blocks Vitamins were designed by a team of bariatric professionals specifically with the long-term health of the bariatric patient in mind. Q: What are the differences between an Essential Package, an Advantage Package, and an Ultimate Package? A: Here is a quick breakdown of what is included in each package. When selecting a package, please be sure it includes the correct Iron supplement (15mg, 30mg, or 60mg+C) for your needs and/or the flavors of chewable supplements you prefer. Q: What is the difference between Building Blocks Calcium Citrate in Orange and Chocolate flavors, as opposed to the Building Blocks Calcium Citrate in Black Raspberry flavor? A: The Orange and Chocolate flavors of our Calcium Citrate supplement have a daily serving size of four (4) chewable tablets per day, two (2) tablets in the morning and two (2) tablets in the evening. These flavors contain a daily serving of 1000 mg of Calcium Citrate, 600 IU of Vitamin D, and 200 mg of Magnesium. The Black Raspberry flavor of this supplement has a serving size of just two (2) chewable tablets per day, one (1) tablet in the morning and one (1) tablet in the evening. This flavor contains a daily serving of 1200 mg of Calcium Citrate, 800 IU of Vitamin D, and 400 mg of Magnesium. Q: Do you offer free shipping on any orders? A: Yes, we do. Free standard shipping is offered on all orders with a Cart Subtotal of $100 or greater within the continental U.S.
Q: How does the Automatic Re-Order program work and how do I sign up? A: Our automatic re-order program offers the ability for your Building Blocks supplements to be shipped every 30, 60, or 90 days. By signing up for this program, you will also receive up to a 7% discount on every automatic shipment, including the order you are placing today! 1. After placing your desired supplements in the cart, proceed to the cart by clicking the cart icon/order total at the top right of the page. 2. Before proceeding to checkout, adjust the Autoship cycle so that it corresponds with the number of supplements in your cart. For example, if you have (3) 30-day supplies of one item in your cart, you will want to adjust the automatic re-order to 90 Days. 3. Select the automatic re-order checkbox above and update the cart. You will see the discount applied and you are then ready to checkout. Remember that all items placed in your cart will automatically ship every 30, 60, or 90 days, including protein supplements.